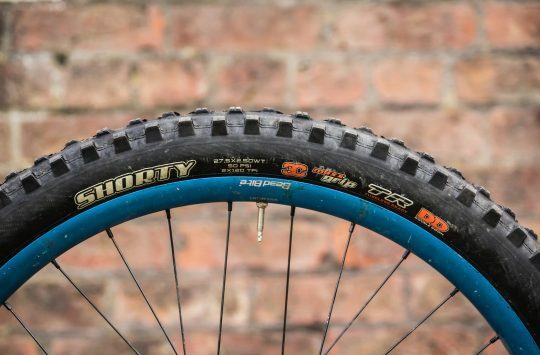 The Minion DHF may be a classic tyre for Maxxis, but this 29×2.6in size is brand spanking new. In fact it’s so fresh, that it isn’t even on the Maxxis website yet. They are on the way though – stock is due to arrive in the UK (and elsewhere around the world) in late January. 2.6in tyres are quite the flavour of the moment. A trend we predicted a couple of years back, the 2.6in tyre width (for both 27.5in and 29in wheel sizes) has been growing momentum due to its Goldilocks-ness that sees it strike the difference between regular 2.4/2.5in tyres and bigger 2.8/3.0in plus tyres. In terms of handling you get a nice big footprint on the trail for more traction, along with a high volume carcass that can be run at lower pressures without suffering from the same wobbliness and vagueness that you can get from bigger plus tyres. 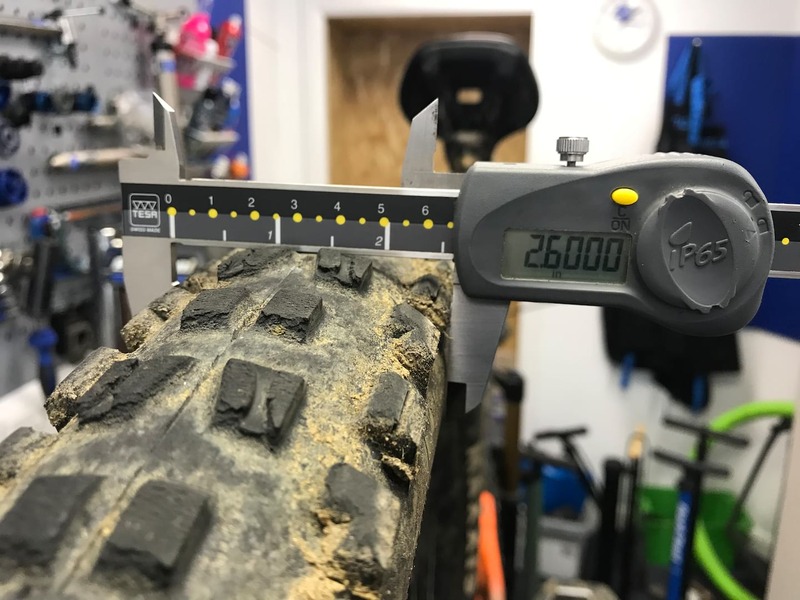 As for frame designers, it’s also more favourable to build a bike around a maximum tyre width of 2.6in, than it is to go up to the full plus width of 2.8/3.0in. If you’re interested to read more about this new trend, make sure you check out our 2.6in tyre mini-group test feature from earlier in the year. 2.6in wide tyres are starting to become available in more tread patterns. Photo: Ben Gerrish. 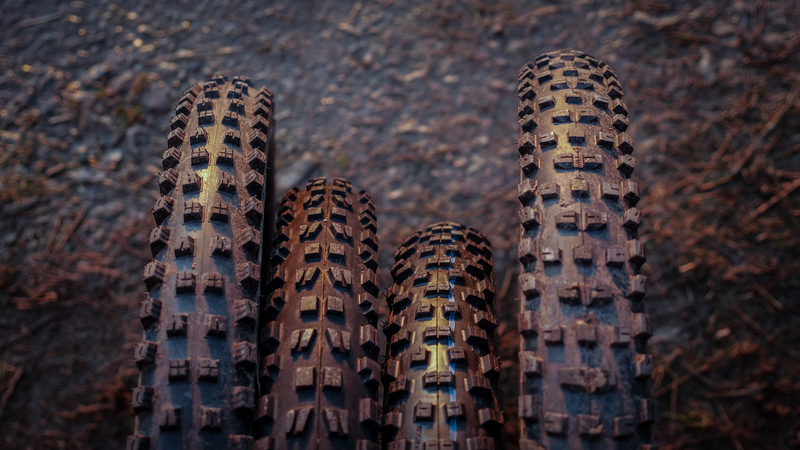 For those wanting more bite again, those three options will also be available in the Minion DHR II tread pattern (and if you’re wondering about how the Minion DHF and Minion DHR II compare to each other, check out our comparative review here). 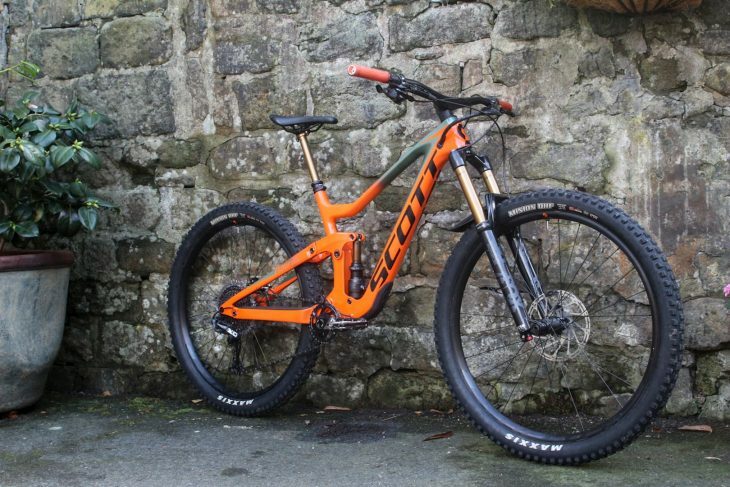 The 2019 Scott Ransom comes fitted with 29×2.6in Maxxis Minion DHF tyres front and rear. 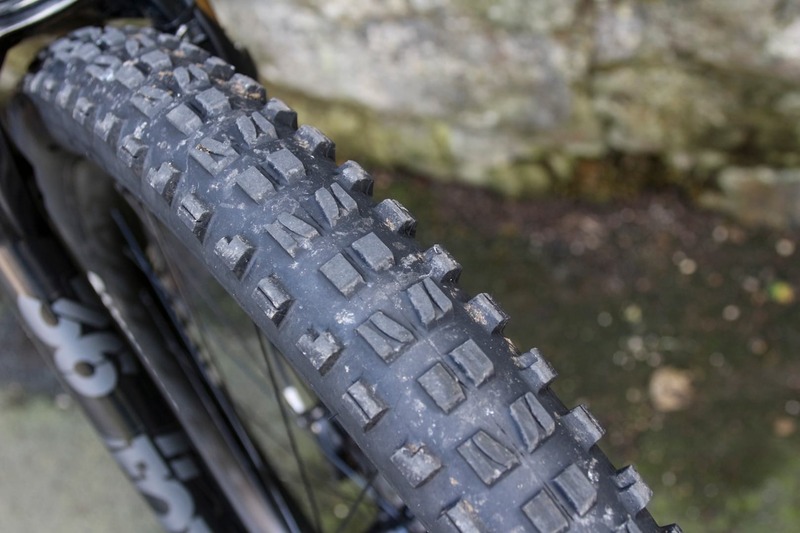 The tyre on review here is the middle option that features a 120tpi casing, 3C MaxxTerra rubber, and EXO reinforced sidewalls. Despite their lack of aftermarket availability, I’ve been riding a set for the past three months while fitted to a 2019 Scott Ransom 900 Tuned that we’ve just recently finished testing. It’s the classic Minion DHF tread pattern, but the blocks are a bit bigger and there’s a little more space between them too. Being stock equipment on the Scott Ransom, the 2.6in Minion DHFs came fitted to a set of Syncros Revelstoke 1.5 wheels that feature alloy rims with an internal width of 30mm. The rims come pre-taped from the factory, and the Minions set up tubeless easily with a floor pump. After a month of riding though, the beads had relaxed enough that the fit became a little looser. I was still able to air them up with a floor pump, but I had to scrape the dried residue sealant from the beads before I could establish a clean seal. Both tyres came in near enough to the claimed weight at 1030g each. Perhaps surprisingly for a Maxxis tyre, they also came in at bob-on the claimed width, measuring 2.6in wide across the tread. I’d expect them to balloon a little further on a wider rim. Thumbs up for a correctly sized tyre. The 2019 Scott Ransom is actually meant to come spec’d with the slightly heavier EXO+ casing on the rear, but those weren’t quite production ready so I had the regular 120tpi EXO casing fitted front and rear on the Ransom. From a testing perspective, this did mean I was able to get a more thorough experience of the same tyre in two different applications. Mounted up to the 170mm travel Ransom, the 2.6in Minion DHFs look properly tough. The jumbo-sized tyres have a very big volume, and that allows for decently low pressures – I had the front set at 16psi, and the rear set at 18psi. That low rear tyre pressure was made possible by running a Vittoria tubeless tyre insert, which I fitted prior to departing for a few weeks riding around places like Lake Garda, Finale Ligure and the Sierra Nevada range. For those interested, you can check out our review of the Vittoria Air-Liner here. 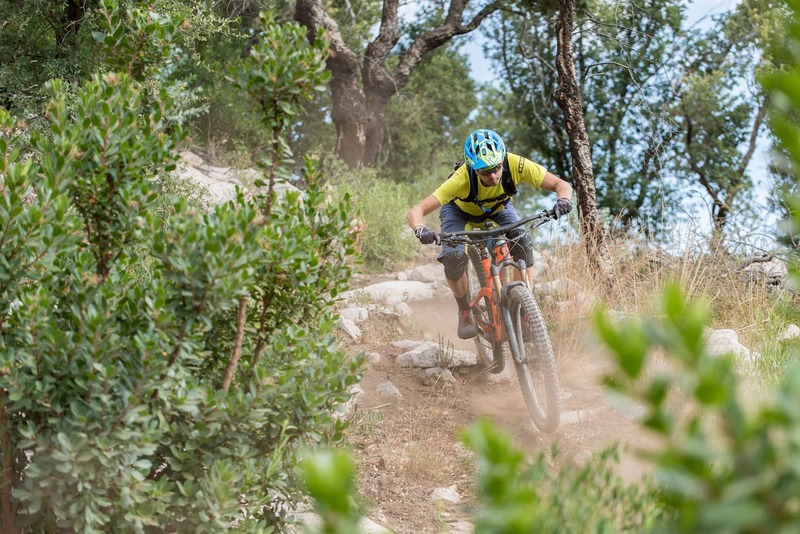 Most testing took place on some very dry and rocky trails around Portugal, Spain and Italy. Photo: Jim Carroll / The Mountain Bike Adventure. FFS Maxxis, I’ve only just bought the 2.5in version. I have some of the 2.6 flavour ones as tested here for a few months now and they are ace, but like the 27.5 I would say if you’re riding somewhere rough/rocky I would stick with the 2.5s. I’m looking to replace the 29 x 2.60 pre-Addix Nobby Nic’s on my ’17 Stumpy with a Minion DHF 29 x 2.50 WT (front) and Aggressor 29 x 2.50 WT (rear) for general trail riding and park use (on 29mm internal width rims). Now I’m wondering if I should wait until the 2.6 DHF is available. It looks like it is only 10 g heavier. benpinnick says “if you’re riding somewhere rough/rocky I would stick with the 2.5s” – why is that? What the advantages/disadvantages of the 2.60 over the 2.50? PS I can’t see any mention of the 2.60 being a WT version (mind you the Maxxis website doesn’t show the 2.50 as being WT but that’s what seems to be available). Launching in January in the UK? Without a MaxxGrip option for the front? @paulcd – The difference with a 2.5in Minion DHF is, well, 0.1in in width 🙂 I put the two side-by-side, and it’s very difficult to tell by eye. But there is a volume difference, and that will give you a more supple and compliant ride with the bigger bag 2.6in width. I think what Ben Pinnick is referring to is tyre durability and pinch-flat resistance, which typically goes down as you upsize tyre volume without adding a lot more meat to the carcass. If you’re riding fast on choppy terrain with lots of sharp and aggressive rocks, then really you want the burliest tyres you can get – which usually means going for a narrower width and a more robust casing. 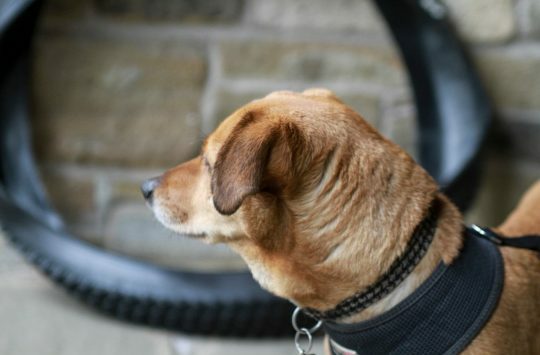 I’d say it also depends on your weight and riding style though – a lighter and smoother rider can get away with a lighter carcass and potentially higher volume tyre. In my case, I paired the 2.6in Minions with a Vittoria Air-Liner in the rear, and a Huck Norris-style insert in the front tyre. Meant I could still run very low pressures and get loads of compliance, while still having exceptional rim and pinch-flat protection that wouldn’t be possible even with a heavier duty tyre. Wil – thanks for the informative reply. I imagine I wouldn’t be able to tell the difference between the 2.50 and 2.60 anyway. I’m not particularly light or smooth (or fast for that matter) but given that I haven’t had any puncture issues with the 2.60 NN’s (running tubeless) I expect the DHR will be fine given it is a heavier tyre (so a stronger casing?). I’m conscious of the extra rotational mass I’ll be adding to the wheels (~200 g each) but as I’m not racing I guess I should just get over that. @paulcd – My pleasure mate! 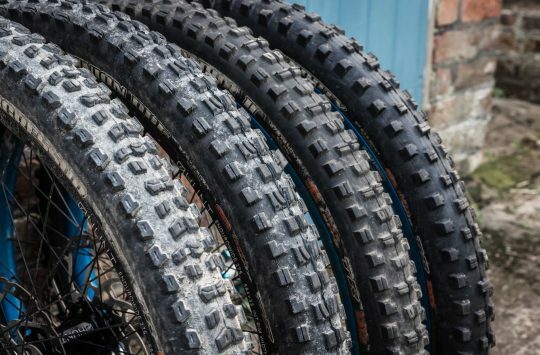 If you haven’t had any issues with punctures or stability with the 2.6in Nobby Nics, then you will 100% be ok with the 2.5in WT tyres you’ve listed (DHF front and Aggressor rear), or the 2.6in Minion DHF tyres I’ve tested here. I wouldn’t worry about going for a heavier casing (Double Down or EXO+) either. I reckon you’ll be a-ok with the lighter 120tpi or standard 60tpi casing. FWIW; I really didn’t like the 29×2.6in Nobby Nics that came fitted to the Scott Genius 900 Tuned I tested this year. I found them to be really floaty in most conditions, with not nearly enough bite. They are light and they roll quick, but as you said, if you’re not racing then that’s less of a priority. The swap to a set of Minion DHF tyres (2.5in WT or 2.6in) is going to give you a load more rough terrain traction and cornering confidence – you are going to love it!